In tough economic times, the number of dogs without homes increases. at home, loving and being loved. Second Chance began in 2003 as Second Chance Rescue for Small Dogs. At that time, there were very few small dogs available for adoption on the Mendocino Coast. And there were more and more older people retiring here, people who would love the company of a small dog. In the San Francisco Bay Area, there were many small dogs looking for good homes but stuck in overcrowded animal shelters. We started bringing the supply to meet the demand--we brought mature, small dogs and found homes for them on the coast with folks who wanted a mature little dog. In four years we found homes for over 100 dogs. Even before doing the rescue, we started in the 1990s bringing up hundreds and thousands of pounds of dry dog food to the Fort Bragg Food Bank to distribute to its dog-owning clients. We are continuing this program. Especially in these tough economic times, many folks can barely afford to feed themselves. Yet their dog is their family, so it has to eat too. The Food Bank does a great job of distributing the food we continue to bring them, at least 250 pounds every week. In 2010, we started also supplying food to Fort Bragg’s Lighthouse Church and Willits’ St. Anthony’s Church to give to dog owners at their free kitchens. In 2007, working with the Mendocino County spay/neuter clinics, we started providing free canine spay/neuter for coast dog owners trying to make it on a limited income. In 2009, we added the Mendocino Animal Hospital in Ukiah to this program. Preventing the birth of puppies for whom there are no homes is crucial to reducing animal suffering. In 2008 we began helping low-income coast pet owners with vet bills for their pets. We can’t always afford to pay the whole bill, but we can provide enough (maximum of $100) for folks to get their sick or injured pets seen by a veterinarian and to get treatment started. In November 2008, just in time for Thanksgiving, we started providing free Frontline flea/tick treatments for the dogs of clients of the Food Bank. We continue to do this, and are up to 140 dogs monthly. We now provide free collars, leashes, and sweaters, treats and toys, too, for those dogs. October 2010 was our first annual free shots and microchips clinic at the Food Bank. Second Chance is a project of Hayward Friends of Animals Humane Society. HFoA was founded by Jeanne Gocker and Steve Sapontzis (author of Morals, Reason, and Animals) in 1985 and has worked throughout northern California to help animals. We are a tax-exempt, not-for-profit, public-benefit, 501(c)3 charity. We are an entirely volunteer organization, with office space and most administrative expenses donated, all the funds we receive can be devoted to helping animals. All donations to Second Chance qualify as itemized deductions on both your federal and state individual income taxes. And all funds donated to Second Chance are spent to help animals on the Mendocino Coast. We welcome your help and support. -- Free dog food. The food is distributed by the Fort Bragg Food Bank, Ft. Bragg’s Lighthouse Church, and Our Daily Bread (at St. Anthony’s Church) in Willits. Ask for the food at those locations. -- Free monthly flea/tick treatment. The dogs are treated the first Friday of each month from 10 a.m. to 2 p.m. at the Ft. Bragg Food Bank. Free collars, leashes, harnesses, sweaters, blankets, toys, and treats are also available at those times. -- Free canine spay or neuter. The operations are performed at the Mendocino County spay/neuter clinic in Ukiah. Call 964-7770 to sign up. -- Free microchip dog identifications, rabies shots, and annual vaccinations. These are provided at the Ft. Bragg Food Bank from 10 a.m. till 2 p.m. the first Friday of every October. -- Free puppy shots (series of three). Call 964-7770 to sign up. -- Financial assistance to get sick or injured dogs seen by a Coast veterinarian. The assistance is limited to $100 per dog per year. Call 964-7770 to sign up. All Second Chance services are to help pet owners whose annual family income is less than $25,000 feed and care for their dogs. SC’s service area is limited to the coastal part of Mendocino County. Second Chance has been helping the dogs of low-income pet owners on the coast for several years now. Along with free dog spay/neuter and food and help with veterinary bills, they give free flea/tick treatments the first Friday of every month to dogs belonging to clients of the Fort Bragg Food Bank. At that time, they also provide free collars, leashes, toys and treats for the dogs. Starting last fall, they added free dog sweaters to what they provide at these monthly events. They call the program “Callie Coats,” naming it after the beloved, recently departed Chihuahua of one of the volunteers. Last fall, Second Chance put out a call to the community asking for donations of yarn, knitting implements, and nimble fingers to make sweaters for our needy dogs. The response was great, and over the course of the fall and winter months they were able to fit over 100 dogs who would otherwise be shivering in the cold with warm, attractive sweaters and jackets. That was almost every doggie sweater or jacket they had. Second Chance wants to get a jump on the coming cold weather and is again putting out a call to the community for donations of yarn and knitting needles and donations of time and skill to fashion that yarn into dog sweaters which will be given away, absolutely free, to pooches in need this coming winter season. Donations of clean dog sweaters or jackets that are no longer needed by you will also be gratefully recycled to someone whose dog does need it. Please call Jeanne at 964-7770 to find out where to drop off your donation or how you can help. the pets of people in need in our community. "Grants help ailing pets as families struggle"
When Riot, a 5-year-old Chihuahua, needed emergency surgery last year for a bladder stone, his guardian, Peter McGurty, started looking around his Brisbane home for something to sell. Video produced by Laurie York & Carmen Goodyear of Mendocino Coast Films. March 3rd was a beautifully warm and sunny day on the Mendocino Coast—doubtless, the silver lining of California’s drought. The great weather brought lots of dog owners out to the Fort Bragg Food Bank to get free Frontline+ flea/tick treatments and other goodies for their canine companions. 175 dogs received these treatments this day. Ten dogs were also signed-up for our free spay/neuter program, and six will now start getting their puppy shots. Those shots are particularly important on the Coast, since parvo is epidemic here. Particularly encouraging was that of the 10 dogs signed-up for spay or neuter, all but one was under 2 years old, and most all of the owners were young people. Perhaps our repeated calls for pet owners to act responsibly, get their dogs fixed, and thereby prevent the birth of unwanted puppies are being heard by the latest generation. Let’s hope so. Our next visit to the Food Bank will be on April 3rd. The first Friday in February, 2015, was the day the Pineapple Express roared onto the Mendocino Coast after a month and a half of little to no rain. It poured and the wind howled, and while all this was much appreciated by draught-ridden California, why couldn’t it have waited just one more day? Anyway, we scaled back our usual spread of free treats, collars, leashes, sweaters, toys, etc., so that we could apply the Frontline Plus and make some of these extras available all within our big, 10’x20’ canvas carport tucked up against the side of the Food Bank. Then we waited to see if people would bring their dogs out in the storm. Well, they did: we helped 130 dogs this day, about 75% of our average number but a great turn-out in such a hostile environment and clear evidence that we are definitely meeting a community need. Second Chance will return to the Food Bank on Friday, March 6th, hopefully in sunshine and with fewer demands on the dedication of our volunteers. In August and October, 2014, the injections were done by VIP Pet Care of Windsor. 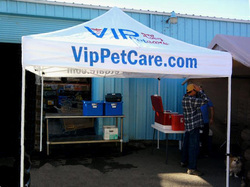 County Animal Care Services now uses them to do their rabies clinics and recommended we contact them about our clinic. They were great! They came to Ft. Bragg the night before and stayed late to accommodate everyone in line by 2:00 p.m. 141 dogs received injections from them: 114 rabies shots, 111 annual boosters, 77 kennel cough shots, and 42 microchip identifications. That’s a total of 344 injections, again shattering last year’s record of 301. Remarkably, all these 344 injections were done by one wonderful veterinarian. The folks from VIP seemed very satisfied with their hectic day’s work. The annual "Santa for the Dogs" event on Friday, December 7th, was held at the Food Bank. The Second Chance volunteers put Frontline Plus on 175 dogs that day, a new record. They also took 97 Santa pictures and gave out hundreds of collars, leashes, toys, sweaters, jackets, and treats. Cindy Bartalini-Humphrey grew up in Fort Bragg, CA and years later, after moving to Sonoma County, she read about Second Chance Rescue Fort Bragg and wanted to help in some way. What Cindy did over the course of a full year earned her the title of "Second Chance Christmas Angel." Thank you Cindy, Petco Santa Rosa, CA, Debbie's Pet Boutique - Windsor, CA, and all who donated to help the dogs in need who come to Second Chance Fort Bragg's monthly clinics. We are deeply grateful for your kindness and generosity. This video is dedicated to you!